Amber Appleton has always had an uplifting and unique perspective on her life. Sure, her situation is less than ideal. She's living in a school bus, her mom frequently drinks and bounces from boyfriend to boyfriend. But instead of wallowing in the uncertainty and quite frankly, unfairness, of what's she going through, she stands tall and proud. She finds ways to keep moving forward, sees the good in everything and (almost) everyone she encounters and more amazingly, tries to help others in need. Basically, she's sorta like a rockstar. (SEE WHAT I DID THERE.) But seriously, I haven't read about a protagonist quite like her before or a book with Matthew Quick's distinct prose. It reminded me of Amelie or a Baz Luhrmann movie. Bright, totally out there and full of heart. From the first few pages, I immediately felt hesitant. Like I said the dialogue and even Amber herself don't quite feel real. I know I haven't heard anyone talk like this and she's surrounded by an extremely eclectic bunch of people who at times felt comical. But I stuck with it because I had a feeling there would be a moment that hooked me. And I was right, although I can't pinpoint exactly when it was. Initially we're learning about Amber and all the lives she touches. There's a woman who's like a surrogate mother to her, her group of guy best friends who all have little idiosyncrasies, a teacher she jokingly nags, a Korean church she attends and a nursing home she volunteers at. Through them, we see more sides to Amber that makes you realize just how awesome she is. But then tragedy strikes and suddenly all the things we've come to love about Amber - like her tenacity and optimism - are gone. Or as least, temporarily lost as she struggles with what's happened. I think that might've been the moment for me. When I realized how invested I was in her because watching the light go out of her big personality pretty much broke my heart. We're talking lots and lots of tears. But what comes out of her grief and out of the people who love her is beautiful. It's impossible to read this story and not be touched by it. I really can't think of any. I think it's just good to keep in mind that it's a little out there but so worth taking the time to read. Yes! I've never read anything of Matthew Quick before and this book really impressed me. I'll definitely be checking out more of his books in the future! Amber sounds really interesting! And so kind to be helping others in need. It can be hard getting into books where the characters don't immediately feel "real" or "realistic". I had that problem when I read The Fault In Our Stars (that changed though). I've been interested in this book and Matthew Quick in general (Forgive Me, Leonard Peacock, Silver Lining Playbooks), but I'm not sure about how I feel about it since the MC shares my same name. Hmm, I think I'll give it a try though. i'm scared of tears though, I don't want to cry over more books…I wonder what the tragedy will be. I read Silver Linings Playbook by Quick shortly after the movie came out. It sounds like he definitely has a certain authorial voice in all of his books, but one that he pulls off well. I may well have to go and check this one out now! Isn't Amber just a great character to read about? I LOVED how optimistic and positive she was, and how she was always looking at the best in the people in her life. That drew me to her immediately, since I'm very similar, so when she felt broken down and sad, I just wanted to hug her so, so much. 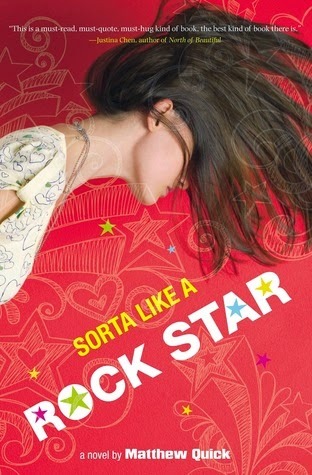 This book was just such a fun read!